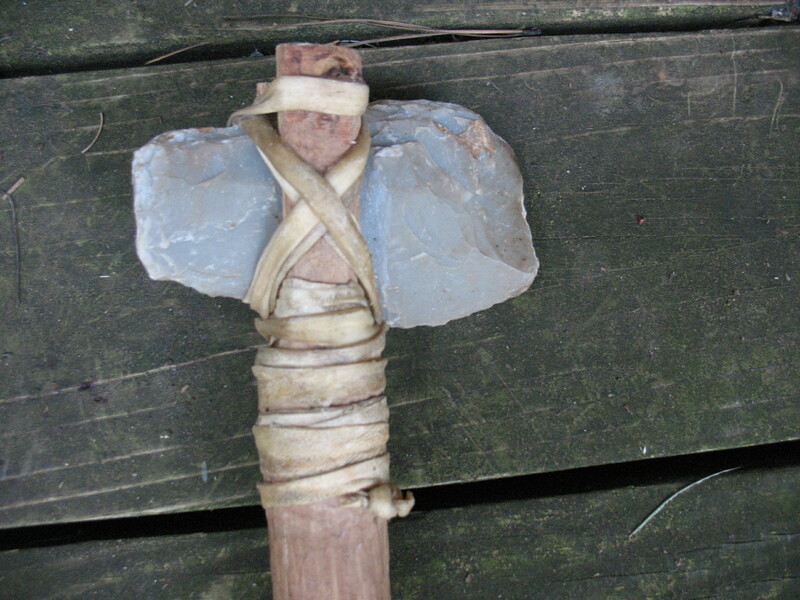 A hand axe, like the one pictured below, will work fine for cutting down small trees. In fact, the hand axe worked so well that it was man’s most advanced tool for about 200,000 years. But, man discovered somewhere along the way, that the hand axe could be made even more efficient by attaching it to a handle that would give it more leverage and force when swung. The hafted axe was born. 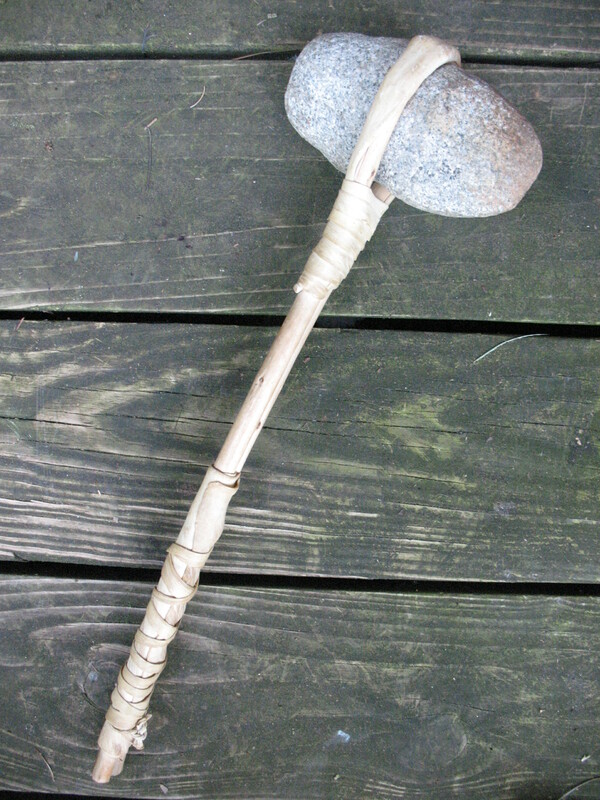 A hafted axe means an axe that is on a handle. This allows you to swing the axe with more force and has a less jarring effect on you hand than a hand axe. There are three components to a hafted axe: (1) the axe head, (2) the axe handle, and (3) some material or method for attaching the axe head to the handle. There are two types of axe heads that you can make; a knapped axe head and a pecked axe head. .
To shape the axe head use a hammer stone to very gently and slowly peck away the unwanted material and leave a finished axe head. I like a nice quartzite rock for a hammer stone. Grains of river rock must be removed very slowly. If you get in too big a hurry you will break the river rock, and this can be frustrating if you’ve already invested three or four hours on pecking away. I find it best to strike at a glancing blow. Select a small area to work on, and work at a steady pace. It will probably take you around eight hours to shape an axe head using this method. It is a good idea to find a nice spot outside to work on your axe head. The constant tapping can drive your spouse to homicidal behavior, and they may grab the axe head and turn it on you. Pictured below: This is not really an axe head. 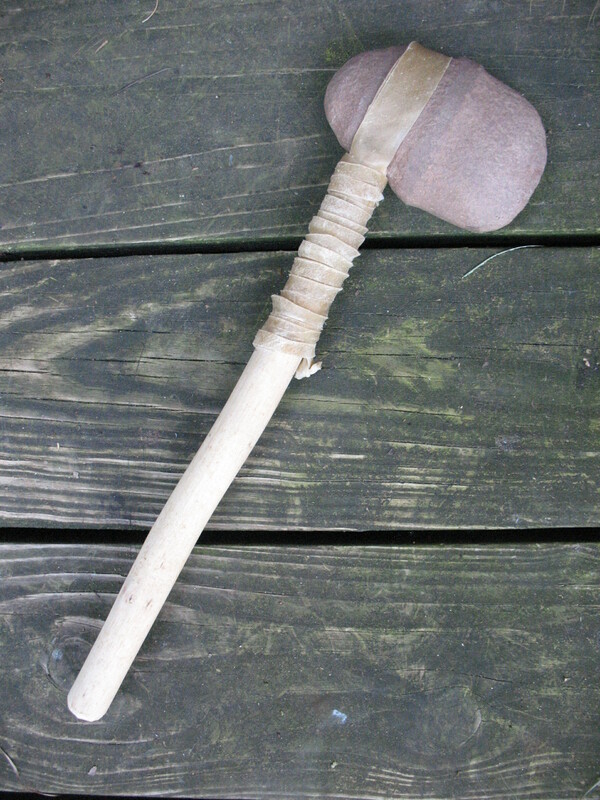 It is a pounding tool that I am going to attach to a handle,but it is made in the same manner as an axe head. You can see where the groove is starting to take shape. 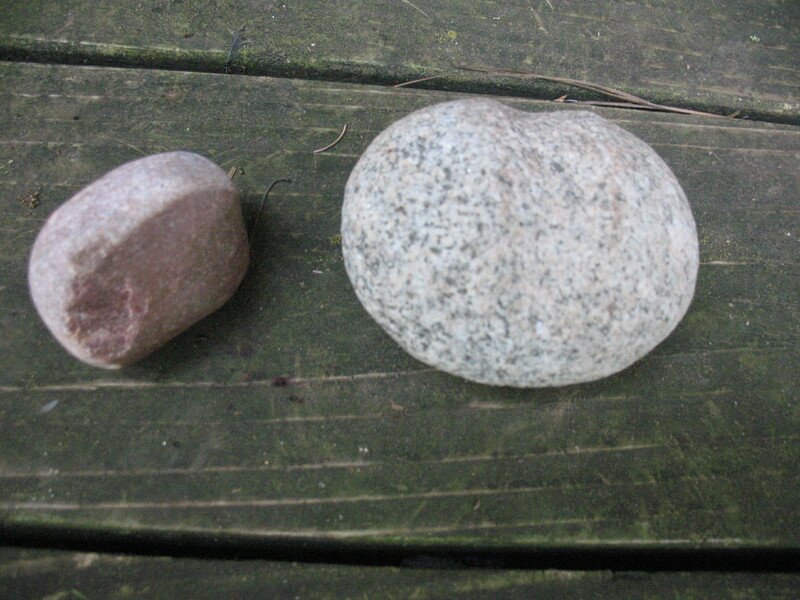 On the left is the quartz hammer stone that I am using. When you have your axe head shaped, there are several different ways that you can attach it to the handle. One way is to split the handle, insert the axe head into the split, and bind the head to the handle using wet rawhide or gut. 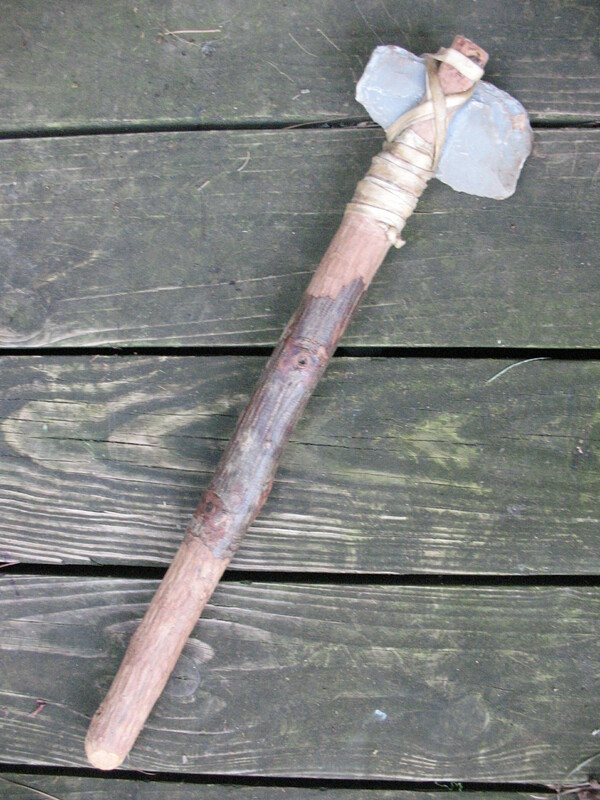 The axe head pictured below is mounted in this manner. Notice that the rawhide is wrapped around the handle below the axe head in order to keep the handle from splitting any more. Another method of hafting the an axe head is to soak the handle in water to make it flexible, wrap the handle around the groove in the axe head, and bind it all in place with wet rawhide. 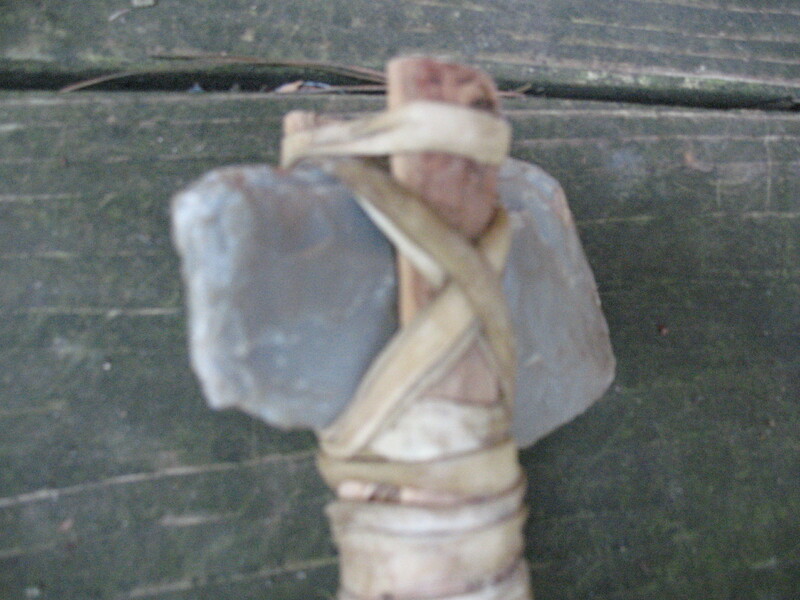 The pecked axe head pictured below has been mounted in this manner. I actually used this axe to cut down a green, five inch tree in about fifteen minutes. 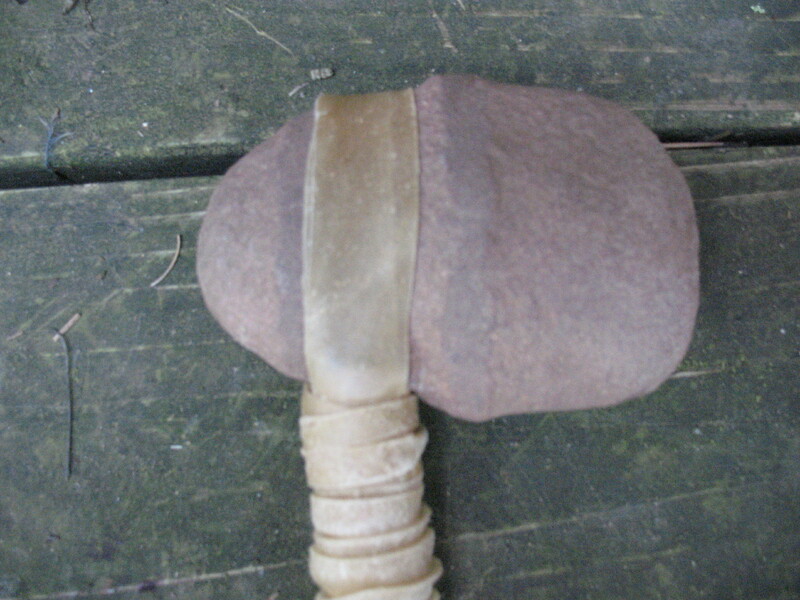 A third method of hafting an axe head is to mount sit the axe head into a groove on top of the handle, and bind the head on with wet rawhide. This, in my opinion does not make a strong enough mount for heavy chopping. 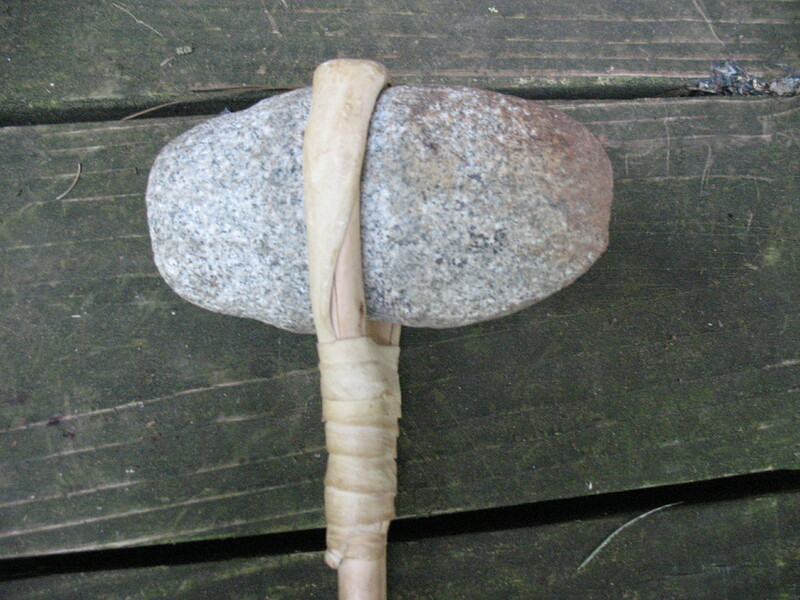 An axe head can be attached to a handle without using any binding by making a celt. A celt is constructed by carving a slotted hole through the handle and then inserting the wedge shaped axe head into the slot. An axe head that is mounted into a celt must be narrower on the head and wider on the blade in order to wedge into the slot properly. The axe head should contact the handle at the top and bottom of the slot rather than on the sides. 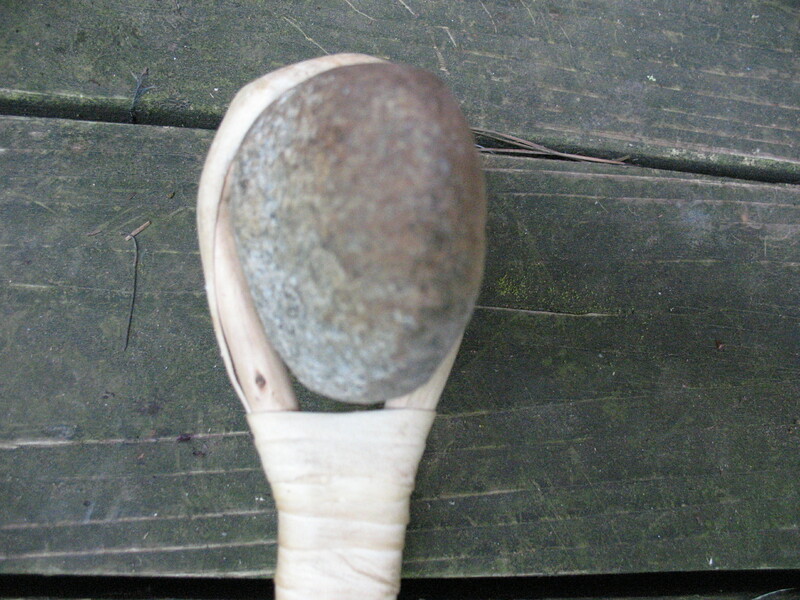 If the head is wedged against the sides, the handle will split when you use the celt. I do not have a picture of a celt because I have never made one, but it is on my to do list, and I will do a post about it when I finally get around to making a celt. First ax, hickory; second ax, willow; third ax, yellow pine. I use the same gear only use Smaugs Tooth 1 instead. Am at 1.7b.